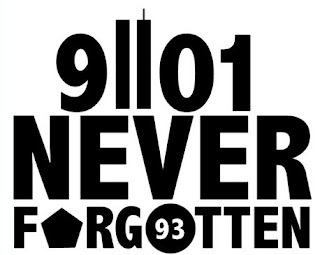 It's hard to believe it's been 14 years since September 11, 2001. I know we all know exactly where we were the moment we heard the unthinkable. I was on a treadmill in the fitness center, a junior, at Ithaca College. Even as I write this post on August 17 and I'm tearing up as all the emotions of that day coming flooding back. It's the same feelings I felt standing in Shanksville, PA at the Flight 93 crash site on the 5th anniversary of the attacks working as a television news producer for a local NBC affiliate. It's always raw emotion. I think the unthinkable does that to us. I also think about how some day (probably sooner than later) I'll have to find a way and the words to explain that pure hate and evil - and heroics, bravery, sacrifice, American pride, and coming togetherness to my young children - because that's how I chose to remember September 11, 2001. The lives that were lost on that day and the days and years following on U.S. soil and around the world, fighting for our freedoms, will never be forgotten. The men and women who ran into the smoke and up the stairways instead of away from it - never forgotten. The widows and widowers, the mothers and fathers, children, brothers and sisters, friends...all left behind - never forgotten. In the words of Alan Jackson: Where were you when the world stopped turning? thanks for sharing this awesome file! Thank YOu, for this 7 all your tuts. They have saved me.